تاج فیروز, بهمن, علی اکبری بیدختی, عباسعلی, عظام, مجتبی, لاری, کامران. (1397). ارزیابی و مقایسه روش‌های تحلیل و پیش‌بینی کشند در نرم‌‌افزار مایک‌21. 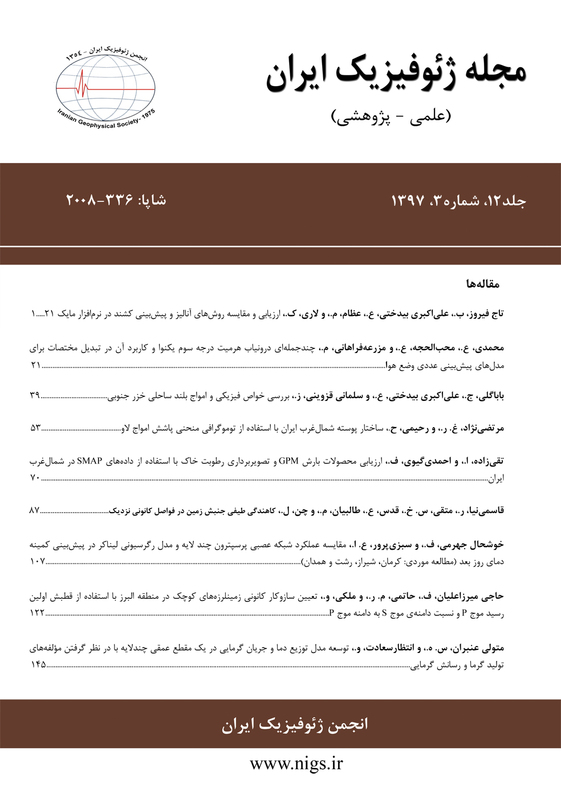 مجله ژئوفیزیک ایران, 12(3), 1-20. بهمن تاج فیروز; عباسعلی علی اکبری بیدختی; مجتبی عظام; کامران لاری. "ارزیابی و مقایسه روش‌های تحلیل و پیش‌بینی کشند در نرم‌‌افزار مایک‌21". مجله ژئوفیزیک ایران, 12, 3, 1397, 1-20. تاج فیروز, بهمن, علی اکبری بیدختی, عباسعلی, عظام, مجتبی, لاری, کامران. (1397). 'ارزیابی و مقایسه روش‌های تحلیل و پیش‌بینی کشند در نرم‌‌افزار مایک‌21', مجله ژئوفیزیک ایران, 12(3), pp. 1-20. تاج فیروز, بهمن, علی اکبری بیدختی, عباسعلی, عظام, مجتبی, لاری, کامران. ارزیابی و مقایسه روش‌های تحلیل و پیش‌بینی کشند در نرم‌‌افزار مایک‌21. مجله ژئوفیزیک ایران, 1397; 12(3): 1-20. در این تحقیق سعی شده است با استفاده از داده­های کوتاه‌مدت و ابزارهای تحلیل و پیش­بینی کشند نرم‌افزار مایک‌21، کاربرد درست ابزارهای تحلیل و تولید داده­های کشند ارتفاعی برای استفاده در داده­های مرزِ باز ( open boundary ) مدل­های هیدرودینامیکی معرفی شود. مایک‌21 نرم‌افزاری قدرتمند در زمینه شبیه‌سازی پارامترهای اقیانوسی و دریایی است. از اطلاعات کشندی برای تولید داده­های مرزِ باز شبیه‌سازی­های دوبعدی و سه‌بعدی مدل­های هیدرودینامیکی استفاده می­شود. دقت نتایج شبیه‌سازی جریان­های کشندی و کشند ارتفاعی، موج، انتقال رسوب و سایر پارامترهای دریایی، وابستگی تام به دقت داده­های مرزِ باز ورودی کشند در مدل هیدرودینامیکی دارد. این تحقیق، بهترین روش تحلیل و تولید داده­های کشندی را با استفاده از ابزارهای تحلیل و پیش­بینی کشند در نرم‌افزار مایک معرفی می­کند. در این مقاله با استفاده از ابزارهای تحلیل، مهم­ترین اطلاعات ساعتی یک‌ساله کشندی ایستگاه­های دائمی بنادر چابهار، شهید‌رجایی و بوشهر تجزیه و تحلیل می­شوند. این تحلیل­ها در دوره­های بلندمدت یک‌ساله، سی‌روزه، پانزده‌روزه و ده‌روزه با استفاده از روش کانادایی گودین‌- فرمن(Godin-Forman) و روش آدمیرالتی (Admiralty) انجام می­شوند. سپس مؤلفه­های حاصل از تحلیل کشند با مقادیر متناظرشان از مدل کشندی TMD مقایسه و ضرورت استفاده از تحلیل داده­های کوتاه‌مدت برای اصلاح مقادیر مدل کشندی در مناطق خاص بررسی می­شود. در ادامه، با استفاده از ابزار کشند موجود در نرم‌افزار، مثال­هایی از داده­های ساعتی یک‌ساله کشندی ایستگاه­های دائمی مطرح و درباره روش­های تولید دقیق­تر داده­های کشندی از مشاهدات بلند‌مدت وکوتاه‌مدت برای استفاده در شرایط مرزِ باز مدل­های هیدرودینامیکی بحث خواهد شد. در‌نهایت، نتایج ارائه شده از لحاظ آماری، ارزیابی و ابزارهای مناسب انجام تحلیل و پیش‌بینی داده­های کشندی در دوره­های مختلف معرفی خواهد شد. The present article addresses a new approach form using tidal analysis of long and short observations of tidal heights by tidal tools of Mike 21 software. Predicted or observed tides must be available as open boundaries in a hydrodynamic model to simulate tidal currents. Mike 21 is a powerful software in simulating of marine and oceanic parameters. Hydrodynamic models use tidal data as a main input in the open boundaries of 2D/3D simulation. The accuracy of the simulation results from tides and tidal currents as well as sediment transportation and other related marine parameters, is quite dependent on accurate input data in the open boundaries of the hydrodynamic model. Large and meso-scale simulations usually use sophisticated global tidal models. These tidal models are prepared by assimilating of satellite altimeter data and tide gage data. The accuracy of such a tidal input seems to be quite sufficient. In shallower part of ocean, like estuaries and coastal areas, these data are not so accurate; therefore direct tide observations are important. On the other hand, long-term tide observations are limited due to technical and economical constraints. In this study, the appropriate solution to tidal analysis and predictions was introduced in the Mike 21 software to produce acceptable and accurate tidal height data. Mike 21 is provided with two different tidal analysis and prediction modules. The IOS and Admiralty methods of tidal analysis and prediction are known for the corresponding high quality functions. Using the software, the tidal analysis of sample data was discussed in order to produce the accurate tidal data. In this article, hourly tidal observations for a year which belonged to three stations in the Oman Sea and Persian Gulf were analyzed. All tidal analyses were performed for one year, 30, 15 and 10 days periods using Canadian IOS and Admiralty method software. The predicted tidal data were compared with respect to observed data for evaluating of computations. Residuals normally will describe such discrepancies, if there are no abnormal fluctuations of tides. These abnormal inconsistencies might be produced by storm surges and other non-tidal effects. The presented results were statistically analyzed. Two different statistical indices, Root Mean Square Error and Reduction in Variance, were used to evaluate predicted tide data. Consequently, the tool for appropriate analysis and predicting of tidal data of the different periods was introduced. It is shown that for long term tide observations, the IOS method is the proper solution for tidal analysis and prediction, while the Admiralty method is fitted for short term analysis and prediction of tides. Admiralty Tide Tables, 2003, Indian Ocean and South China Sea: Hydrographer to the Navy, Admiralty Hydrographic Department, 3, 357 pp. Boon, J. D., 2013, Secrets of the Tide: Tide and Tidal Current Analysis and Predictions, Storm Surges and Sea Level Trends: Elsevier. DHI, 2014, DHI Software 2014, Tide Tools Scientific Documentation. DHI, 2017, MIKE 21 Toolbox Global Tide Model-Tidal Prediction. Doodson, A. T., and Warburg, H. D., 1941, Admiralty Manual of Tides: H. M. Stationery Office. Foreman, M. G. G., 1979, Manual for Tidal Heights Analysis and Prediction: Institute of Ocean Sciences, Patricia Bay. Glen, N., 2015, The Admiralty method of tidal prediction. NP 159: The international hydrographic review, 54(1). Godin, G., 1972, The Analysis of Tides: University of Toronto Press, 1st edition. Hicks, S. D., Sillcox, R. L., Nichols, C. R., Via, B., and McCray, E. C., 2000, Tide and current glossary: National Oceanic and Atmospheric Administration, National ocean service, Center for operational oceanographic products and services, Silver Spring, 1-29. Iran National Cartographic Center, 2016, Tides, http://www.ncc.org.ir. Martin, P. J., Smith, S. R., Posey, P. G., Dawson, G. M., and Riedlinger, S. H., 2009, Use of the Oregon State University Tidal Inversion Software (OTIS) to generate improved tidal prediction in the East-Asian seas, DTIC Document. Matsumoto, K., Takanezawa, T., and Ooe, M., 2000, Ocean tide models developed by assimilating TOPEX/POSEIDON altimeter data into hydrodynamical model: a global model and a regional model around Japan: Journal of oceanography, 56(5), 567-581. Padman, L., and Erofeeva, S.,2005, Tide Model Driver (TMD) Manual: Earth and space research. Pugh, D., 1987, Tides, Surges and Mean Sea Level: A handbook for engineers and scientists: John Wiley and Sons, NY. Schureman, P., 1958, Manual of harmonic analysis and prediction of tides: US Government Printing Office. Simon, B., 2013, Coastal Tides: International Hydrographic Office, France.